In what was surely one of the most important, and explosive rounds of the tournament, the players kept the spectators on the edge of their seats until the very last game of the round was finished (over 6 hours of play, a record for this year’s championships). 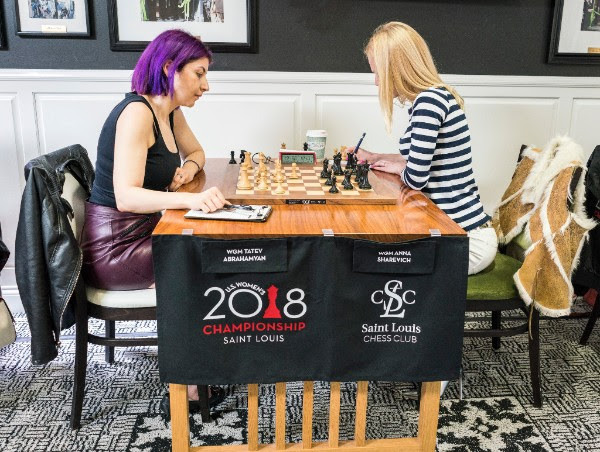 Both championships are heating up, and the heat of the competition is unraveling throughout the halls of the Saint Louis Chess Club. Let’s get right into the recap and find out what happened in today’s round! The timid opening employed by Zherebukh did not pay dividends, as Izoria skillfully neutralized White’s ideas and created the unpleasant weakness on c4. 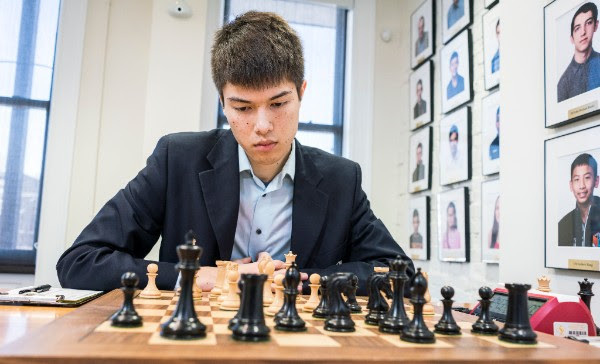 Zherebukh understood that he was no longer holding any sort of opening advantage, and quickly pulled the brakes to stir the game onto a drawing path. The players agreed to a draw at move 35 after most pieces got exchanged. Despite this one being a wildly acclaimed game of the round, if not the tournament, So’s opening approach was mellow. 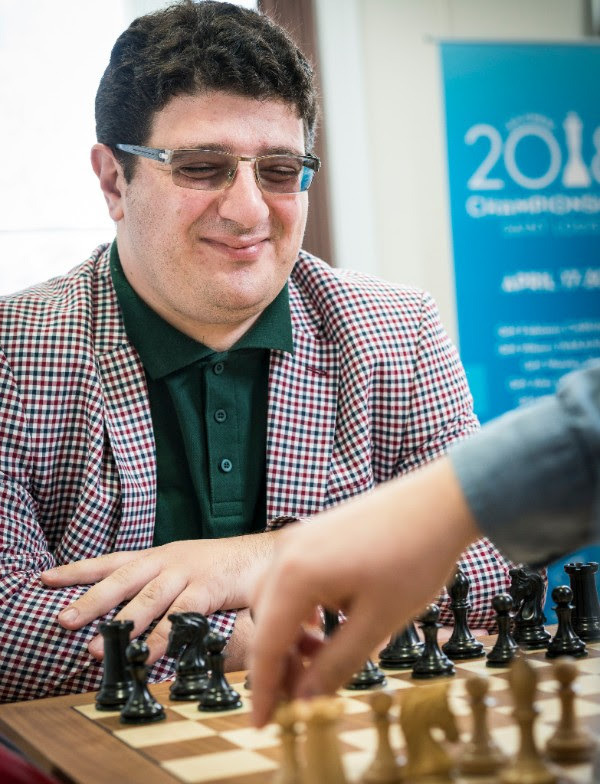 His pulseless attempt at destabilizing the Petroff held no ground against Caruana’s deep understanding of important topics such as piece placement and piece exchange. So tried to squeeze water from stone in a symmetrical endgame, but was forced to concede a draw at move 46. Caruana maintains his co-leadership position, while So remains half a point behind. The marathon game of the round. The players kept the fans, commentators, and visitors on the edge of their seats all the way until the end. The game lasted 144 (!) moves and was won through pain, sweat, and a lot of tenacity. For the most part of the game, the position remained close to equality, but it was Robson who always seemed to have just a tiny edge, due to his preferred side of the material imbalance present on the board (two pieces vs rook). Akobian held his own until deep into the endgame, where he erred and allowed Robson to get a winning advantage. Robson returned the favor and allowed Akobian to build a fortress. The players shuffled the pieces for a while, and at some point Akobian tried to claim the threefold repetition. He leaned towards Robson, telling him that with the upcoming move the position would repeat the third time. Robson denied the claim, and it was at this moment that Akobian made a huge mistake, he continued the game! Instead, he should have stopped the clock and claim it with the arbiter. Once the game continued, Robson slightly changed the position, and when Akobian officially claimed the draw a few moves later, the claim was denied due to the different position present on the board. Obviously shook by the news, Akobian started erring and allowed the White king to approach the d pawn, which tipped the scale in Robson’s favor. 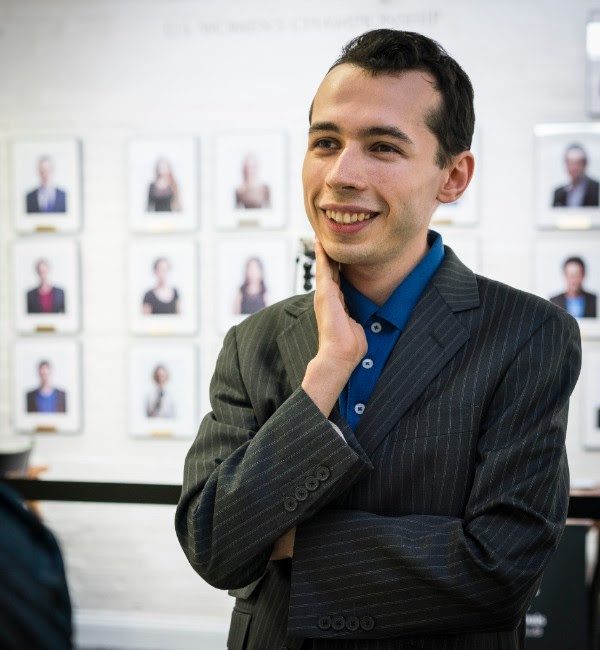 The game was over after Robson skillfully proved he knew how to checkmate with Knight and Bishop, an instructive lesson for the students of the game. Liang has been having a solid event, but so did Lenderman who won a beautiful game against Onischuk in the previous round. The game followed a theoretical line of the Petroff and it seemed as if the players would liquidate the pieces and soon agree to a draw. But Liang had different plans, as he started looking for complications. 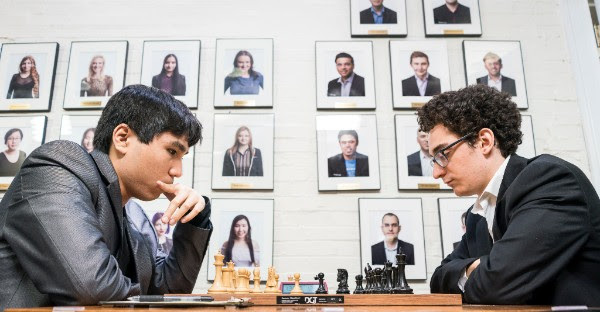 Unfortunately for him, the overly ambitious moves he made were double edged, as they allowed Lenderman to dent into White’s pawn structure and create weaknesses. Lenderman accurately assessed Liang’s pawn push, and securely stopped it in its tracks, while at the same time picking up pawns and obtaining materials advantage. The game was over right before the time control, when Liang’s dynamics suddenly stopped, and he had to face the music being a Bishop and several pawns down. 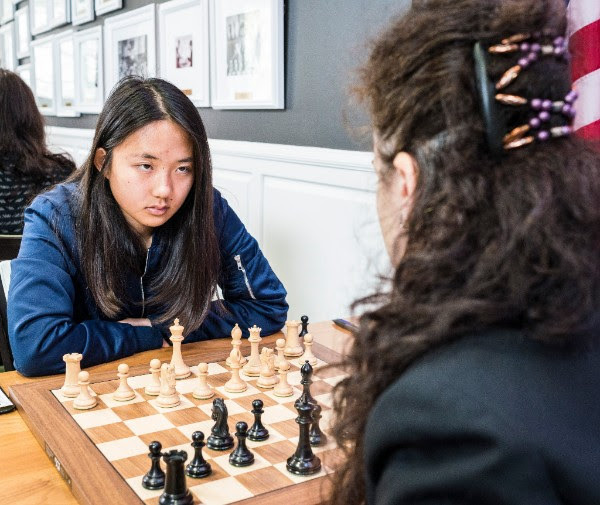 One of the most intense games of the round was between Wang, representing the future of American chess, and Krush who has been the face of the American women’s chess scene for the last decades. Krush, respecting her status, got an early advantage with the black pieces, and it seemed as if Wang would finally taste defeat. But the youngster wouldn’t go away! 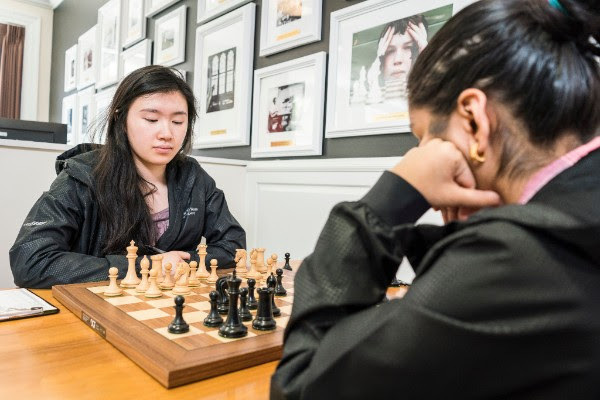 The tenacity and practicality with which Wang was making her moves placed huge pressure on the seven-time champion, and Krush was unable to deliver the killing blow. It was then that the young Wang started believing in her chances at more than just holding a draw. And the miracle happened, as Krush started playing bad move after bad move, ending up in a completely losing position due to her back-rank weakness. It was when Wang masterfully coordinated her pieces that Krush had to admit defeat. Wang maintains her 1 point lead and is currently playing the most inspiring chess in the tournament. Abrahamyan got an early lead after the opening, but it was only after Sharevich trapped her own Knight on g5 (instead of placing it on a more defensive square on f8) that she got the decisive advantage. Abrahamyan accurately converted the extra pawn and moved to 5 out of 8 points – 2 points behind the leader Wang. A game which seemed to go nowhere after the opening. The two players willingly entered an almost symmetrical endgame, and it looked as if they would soon agree to an undisputed draw. But then Gorti started erring, and Yu took full advantage of her opponent’s inaccuracies. Yu found the rook exchange with 29. Na7! and the ensuing Knight vs Bishop endgame was simply impossible to defend for the young Gorti. Yu wins her second game in a row and now stands at a respectable 4.5/8 points. After 5 losses in a row, Goletiani finally found the path to victory in her game against the out of shape Derakhshani. Goletiani chose the Anti Grunfeld, and it was obvious as early as move 6 that her opponent was nowhere close to being prepared, as she stumbled into a known opening trap. The ensuing endgame was borderline winning, and Goletiani never allowed her opponent back into the game. An exciting finish awaits us as we enter the final three rounds of the 2018 U.S. Championships! 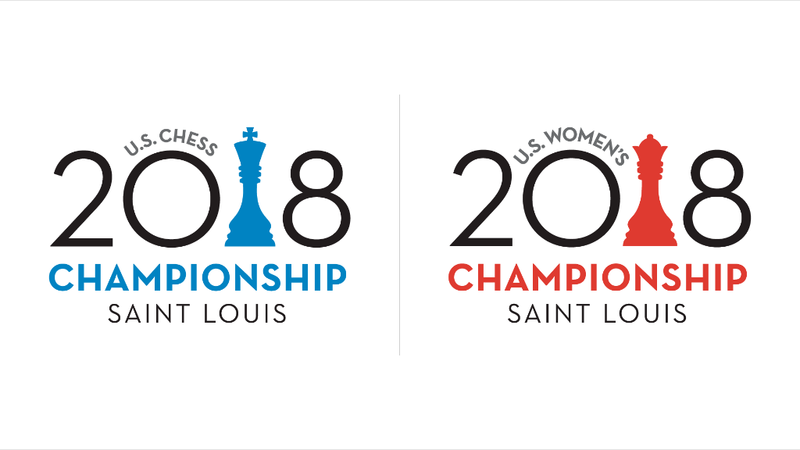 Watch the games of the U.S. Championship 2018 and U.S. Womens Championship 2018 with computer analysis LIVE on ChessBomb.